We all dress up for Halloween occasion, why not dress our computers as well? 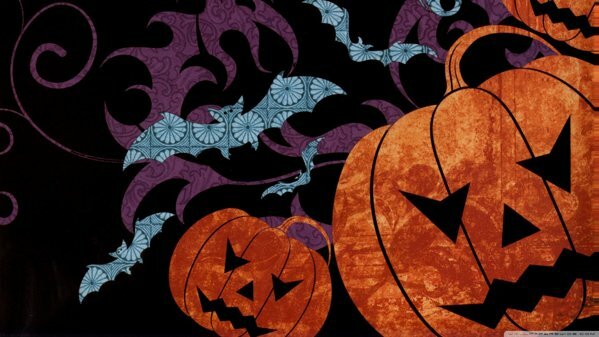 Today I got for you a cute… I mean scary little collection of Halloween wallpapers for your computers and mobile devices. All you have to do to download the wallpapers, is click on the title/name of the desired wallpaper. Then you’ll reach the source site, you’ll easily spot a “download” button. If you have any ideas for a Halloween related post, send them to me through the comments section below. We have shared Halloween design resources and we also share wallpapers according to the season, but we’ve never shared Halloween wallpapers before, here you go. UPDATE: Check out our latest collection of Halloween Wallpapers 2016. Fun Fact: The movie Halloween (1978) had a very low budget, so they had to use the cheapest mask there could be. Micheal Meyers (actor) used William Shatner’s Star Trek mask. Shatner did not know what history the mask had, but when he did years later, he said he felt honored. Cats are probably the cutest possible pets. But who knew a cat wallpaper could be so creepy! Ghosts are supposed to be real scare but ever since I became a Harry Potter fan, I really look forward to meeting a few ghosts. Halloween pumpkin wallpapers are usually scary, but this one is really cute. How scary it would be if a hand just popped out of the door and unlocked it? Sends a shiver down your spine, doesn’t it? For all my classical gamer friends, here’s something with a blast from the past. Now this is a house that has “mad witch” written all over it. I mean who would live at such a dark, creepy, lonely place. The haunted house beside the graveyard finds light on every Halloween. All windows light up now. Let’s see some fun wallpapers then. This a typography based wallpaper themed for Halloween. This is not just a wallpaper but a really cool background for a flyer or poster as well. Paint on pumpkin decorations for Halloween. The king of the ring. Danbo, the least scary creature possible to be created. They dressed really well, didn’t they? Tickets to a Halloween party poster maybe? I added these kind of wallpapers because they are not necessarily scary, but rather positively cute. Because you have to dress up according to the occasion. This is the last Halloween wallpaper in this list. I’m ending with a Mac specialist. That’s it guys. Stay safe, wish you a lovely Halloween. Until tomorrow, see you.